The Chapelwood School is a fully-accredited educational program for young children between the ages of three months and pre-kindergarten. 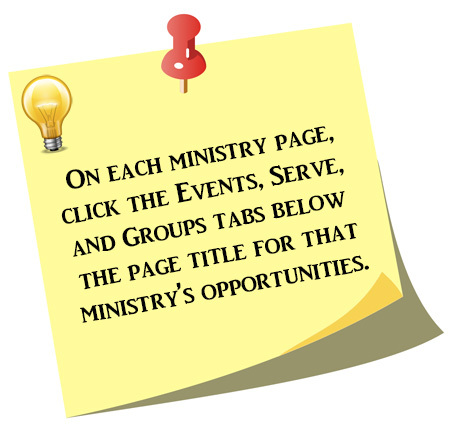 For a quick look at events, serving opportunities, and grow groups, click the tabs above. For a much more comprehensive look at the school, visit our website, at www.chapelwoodschool.org. I am a teacher assistant and I help out the lead teacher in any way I can. I clean the tables and the mats every single day. I monitor the kids when they are playing together. I also change diapers and help them wash their hands. My job allows me to be involved in the kids’ daily routine. Mickey and Minnie Mouse, because they are classic and wholesome. If I could go anywhere in the world for two weeks, it would be . . .
Armenia because it is my homeland and I would love to see my family. As a child, I wanted to grow up to be a . . . I think children are happiest when . . . They are allowed to be themselves and play together. When I drive, I listen to . . . Going to the beach with my family every summer. Working with children, seeing them grow up, and being a part of their developmental stages. As a lead teacher, my job is to implement meaningful lessons that cover a curriculum rich in experiences that nurture the whole child, and to ensure physical and emotional safety. My kids and I get to go to Mexico City where we were born, and where my family lives; we get to immerse in our culture and be pampered by all our relatives. Has always been the Pink Panther because of the different kinds of trouble he would get into, and because as a young spectator I had to pay more attention to the story and the actions, rather than the spoken language. If I could go anywhere in the world for two weeks, I would go to . . .
Greece, because I have always been amazed by what the Greek philosophers accomplished just by using knowledge and observation. If I could trade lives with anyone for a day, I would be . . .
One of my three kids, because I think being “in their shoes” would give me a better perspective and understanding of how they see life and its many challenges. When I drive, I like to listen to . . .
A variety of music, such as classical, 80’s pop, 90’s rock, Latin jazz, among others. Any kind, what matters to me is the company. That I get to spend part of my day building a very important relationship with each and every one of my students, by coaching them, listening to them, helping them be proud of all the good things they can do, and helping them work on those big and small challenges that are part of being at school and making friends. Being a Preschool teacher makes me feel more, way more important than any CEO, because I get to nurture little kids’ minds - to me, no other job can be more important than that! Texas History and European History. We learn from the past. They are loved unconditionally; given boundaries; taught respect, control and independence. If I were famous for fifteen minutes, I would . . .
Visit a children’s hospital and cheer up the boys and girls as time permitted. If I couldn’t be a teacher, I would probably be . . .
A psychologist. Both my father and brother were psychiatrists and I love to figure out people’s problems. “I can do all things through Christ who strengthens me.” Philippians 4:13. This is something I tell myself a lot, and it really helps. If I could trade lives with anyone for a day, it would be . . .
Princess Kate of England because I would be able to be with Prince George who I think is the most adorable child in the whole world! As an assistant teacher of three and a half and four year olds at Chapelwood School, it is interacting with and nurturing the children on a daily basis. It is also earning their love and watching them learn and grow. My name is Nomik Assatouri. I have been in the United States for 29 years and I have been working at Chapelwood for 17 years. I would like to go to France and Germany to visit my brother and sister. When I was young, I wanted to be a . . .
My favorite food is . . . Being around the children and teaching them. When I wear my Sensory Motor Teacher Hat, I challenge children with motor activities that provide experiences that help their bodies develop while sharpening their perception skills and maturing their neurological systems. Some of the life skills learned in motor class are listening skills, thinking skills, self-control and social growth. Working at Camp Chapelwood. As Director this requires me to create and implement programs for elementary age students to learn new skills, develop new interests and develop spiritual awareness. The best part of this position is that we have a reunion with former students. I think children are the happiest when . . . They are allowed to be active. They learn best when they are doing! If I could be anyone for a day, I would be . . .
My granddog Bella. She gets to eat, sleep, swim in the lake and play ball all day and have people loving her hourly. In a snowstorm in Colorado. I backed out of a driveway and could not see the dam that was made by a snowplow. I was not even able to open my car door. I was an only child so my favorite childhood memories were when I went to friends’ houses and we played board games. Watching children grow from the seeds planted in preschool, elementary, high school and sometimes college to responsible young adults. My job duties include assisting the lead teacher, making copies, and having the classroom ready. I love to spend time with my family, my daughters and my grandchildren. I also love yoga, walking and meditation. The Holy Land of Israel. I would like to learn more about the places there. I would like to visit the temple, the sorrow place, and the place where Jesus was baptized. When I was a child, I wanted to grow up to be . . . I always wanted to be a doctor because I love to take care of and help people. Classical music and Gregorian Choirs. The music makes me feel very relaxed and cautious when I drive, ready to go work. Sitting at a big table for dinner with my mother, father and ten siblings. We would talk, laugh and spend time together. St. Paul’s letter to the Corinthians, Psalms 23, 55 and 91. I love international food, but my favorites are Mexican food, salmon, and fish. The best part of my job is interacting, educating and taking care of the children at school. I love being with them every day. Eep Crood from The Croods. The reason is because she is very adventurous and curious. She is not afraid to explore new things. Language Arts in eighth grade. The reason was my teacher, Mr. Mieres. He introduced me to great books like Tiger Eyes and Are You There God? It’s Me Margaret, by Judy Blume, which are some of the best books I've ever read. When I was a child I always wanted to be . . .
A nurse, because I've always wanted to help people in need. The summer that I went bike riding with my best friend and her older brother. That day we rode all through Memorial Park and Spring Branch, which was very fun. “Treat others as you want to be treated.” If everybody did that every day all day long I think this world would be a better place. A person – my younger sister Melissa. She’s very funny and charismatic. Working with children. Every day what I am teaching them will help them in the future. My primary job responsibility is teaching young three-year-olds in Chapelwood’s School for Young Children. Spending time with my dogs hiking in cooler places and volunteering for various animal welfare organizations. If I could go anywhere in the world for two weeks it would be . . . Floating down the Amazon River in the middle of the jungle with an extremely knowledgable guide. If I could trade lives with anyone for a day it would be with . . .
Any of the children in my class so I could continually strive to be the teacher they wished they had. They’re allowed to be children and explore their world freely. “There’s always tomorrow for dreams to come true,” from Rudolph, the Red-Nosed Reindeer. I often sing this to the children in my class when they don’t get to finish something they were working on before they have to leave for the day. A veterinarian, so I could give free care to those who need it most. Dragons Love Tacos, because it usually leads to a classroom taco party that the children have the opportunity to plan from start to finish. That being said, my favorite food is of course, tacos! I’m surrounded by the love of young children all day long and I’m constantly inspired by all the love they have to share with others. I am a five days a week lead teacher working with 3½ year old children. We do have formal study units each week, and work on letter and number recognition, but our main focus is on teaching the children how to work and play together successfully. Jessica Rabbit from, Who Framed Roger Rabbit? When Jessica was asked what she saw in Roger, she said, “He makes me laugh.” Now that’s a cartoon character that understands relationships and what makes them last! My favorite subject in school was always art. The creativity, the materials and the endless possibilities are very exciting to me. That is one of the things that I love so much about my job, every study unit includes art projects - so fun! My favorite movie quote comes from The Martian. I just love it when Mark Watney says; “When you find yourself in a situation, don’t give up. Do the math. Solve the problem, then move on and solve the next one.” So my favorite movie quote is, “Do the math.” Of course, my daughter Mallory is an Applied Mathematics major at Texas A&M, so the quote speaks to me from a mother’s point of view. I’ve been saying that to her for years. I have two favorite hobbies, cooking and tennis. Both of these activities include my husband and my daughter. My husband, Don, is my mixed doubles partner and we love to play against our daughter, Mallory who is a champ rated player. We play California Doubles and she always beats us, but we have a great time together. We also spend a lot of time cooking together. Don is a grill master and Mallory and I love to whip up gourmet meals together to feed family and friends. “Consider it all joy, my brethren, when you encounter various trials, knowing that the testing of your faith produces endurance,” - James 1:2-3.If you can look at the joy, as well as the pain you have in your life as things that help to shape your Christian character, then I believe you are following Jesus’ example. I just generally laugh a lot, but children probably make me laugh the most. They are so entertaining in their perspectives. The way children look at things can make you wonder why adults have so often locked out other possibilities. It is just delightful to see the world through a child’s eyes. I have so many happy memories from my childhood, but one of my favorite ones would have to be family vacations every summer. We all love to go to the lake house at Possum Kingdom. My entire family would water ski, go fishing and ride around the lake on the barge. Growing up in Midland, Texas, it was a real treat for me to go to the lake. The best part of my job actually has two parts. First, being able to work with children, right at the age where their curiosity and thirst for knowledge collide into a remarkable opportunity for a teacher to have a huge impact on their love of learning is amazing. The second part would have to be being able to teach in a faith-based school. After years of working in public schools, the comparison on the surface may seem small, but in fact, is huge. Both the staff members and our school families embrace Christian values and encourage sharing Jesus’ teachings equally with teaching social skills and academics. It doesn’t get any better than that! My hobbies include listening to different kinds of music, reading self-help books, novels, and solving sodukos. I would trade lives with myself from the future to see how all my hard work and dedication pays off in the future. When we used to go to my grandpas house to celebrate birthdays and holidays, because the whole family would get together at their place and we were more than 50 people! Psalms 28-7: The Lord is my strength and my breastplate, my heart had faith in him and I am helped; for this cause my heart is full of rapture, and i will give him praise in my song. Interacting with children, parents, and my coworkers every day. I love and enjoy being around young children. I assist in implementing the curriculum, carrying out various duties and ensuring safety guidelines are met. Charlie Brown and Snoopy because they problem solve together. Luke 6:31 - Do to others as you would have them do to you. I am the teacher assistant in the 2 1/2 year old class. My job responsibility is to keep the children safe and happy and assist the teacher in the class. Traveling to places that I have never been. Winnie the Pooh, because he is a very tender bear. Music, because I like music and dance. Anywhere in Europe, because anywhere you go it’s beautiful. The news, because I like to know what is going in my city, country and everywhere in the world (APR Station). When I played with all my cousins when we got together. I enjoy listening to the kids when they talk to me. Geometry. It was a subject which can be so concrete you see it everywhere around you, yet can be so abstract it becomes invisible when you try hard to "see" it. I love to play with puzzles. My daughter gives me a puzzle for Christmas and another one for my birthday, every year. She knows what I love. As a child, I wanted to grow up to be . . . I wanted to be a teacher... look where I am now! When I was probably seven, my parents took me for a picnic, which was a true treat. I remember running around in the warm sun. I remember the taste of the orange my mom gave me and I can still smell the grass today! My all-time favorite book is The Wizard of Oz. Still haven't watched the movie yet. I believe the version in my imagination is the best one. Japanese food although I rarely feel full while leaving a Japanese restaurant. A bowl of hot noodle soup means heaven to me on a cold winter day. When I see a child who cried so hard on the first day of school is actually laughing so proudly at the graduation. I am the lead teacher for a young toddlers class. I have the best job ever because I get to love on little ones, showing them God's love, telling them about God and Jesus, and just being able to influence and watch children as they grow and learn. In high school I loved English. We had to write a lot, which allowed me to escape into the joys of writing about new worlds and experiences. In college I loved all my psychology classes because I learned so much on how people think and feel. Reading, singing, and dancing. I am part of the choir at my church. I also dance ballet, tap, jazz, soft shoe Irish, and hard shoe Irish at the same dance studio as my girls. When I was a child I wanted to grow up to be . . .
A homeschool mom and have kids of my own as well as adopt lots of children from other countries. They feel loved and know someone is there for them, to show things that bring them joy and excitement as well as to comfort them when they’re hurt or sad. If I could trade lives with anyone it would be . . . The big hugs, the smiles and laughter, as well as watching their joy and wonder when we play with sensory items like bubbles, shaving cream, rice, sand, paint, etc. Dora the Explorer, because she teaches kids different things around the world. Art, because I love to draw and paint. They like what they're doing. Fajitas, enchiladas, chiles relleños, and barbeque sliced beef sandwiches. Working with infants. I love working with them.